Having reached the northernmost point in India that foreigners are allowed to go to (in the Nubra Valley in Ladakh about 60 kilometers from the Chinese border), we made the turn and started heading south again. The first seven kilometers of our return journey was walking across sand dunes accompanying some Bactrian (2 humps) camels, their handlers, and two German architects, but that’s another story. After flying first to Delhi and then to Goa, we made our way south by train and bus (did you know that they made buses without windows?) to the heart of the state of Kerala and a small city called Alleppey. This is the gateway to the famous backwaters of Kerala, a 900 kilometer network of waterways that extend from the coast of the Arabian Sea inland. We arrived by bus at 8:30 AM after a very early morning departure from Cochin. We were surprised that the tourist office was open and we went in to enquire about renting a houseboat for a trip into the backwaters. The man, who didn’t speak much English, said that the Keralan state government (which is communist incidentally, and has as its flag a yellow hammer and sickle on a red background) had houseboats for rent. He phoned a man to come to show us their boats, who instead walked us back to the office at the government guest house nearby. We spoke with a manager, who looked like he’d just woken up, and agreed to go to see two boats, one of which was available for a single night, and the other for two nights. He called an auto-rickshaw driver, and we agreed to pay 20 Rupees (50 cents Canadian) for the ride if we didn’t rent a boat, and nothing if we did. 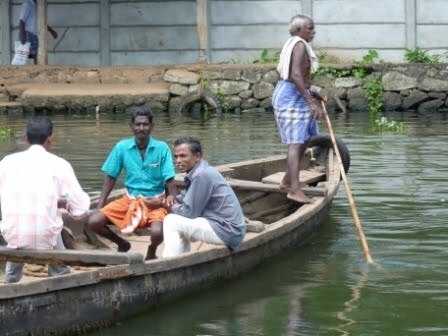 After a ten minute drive that concluded down a tiny dirt lane barely wide enough for the rickshaw, we saw the two boats. The first one we saw had recently been renovated and looked brand new. The other was smaller and older. Both were available for 3500 Rp a night (about $87 Canadian, including a crew of two, a cook, and all food and water), but the nice one was only available for one night and we preferred two. 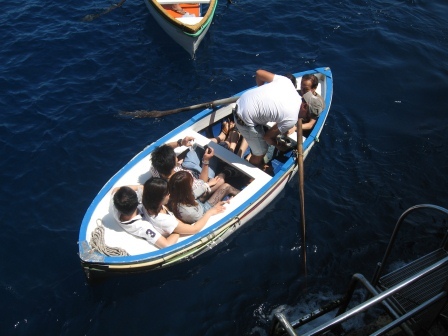 After much discussion, walking up and down the waterfront to view another boat, and at least five cell phone calls to the boss, they agreed to rent the nice boat to us for two nights at 4000 Rp a night. 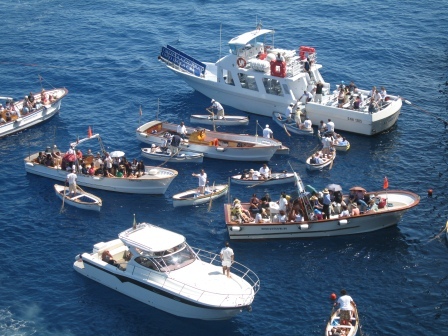 They would make other arrangements for the people who had booked it (a party of thirteen who were renting three boats). After a quick trip back to town to place our deposit, have breakfast, and buy a case of beer, we boarded our houseboat at 11 AM and were greeted by the friendly crew bearing glasses of pineapple juice. Our houseboat is about 15 meters long (50 feet) containing a large living area in the bow (complete with TV and DVD but no disks), two bedrooms with ensuite bathrooms, and a large kitchen aft. Its curved roof is made of woven reeds over a bamboo frame. Up top there is a small, covered seating area that is reached by a ladder from the bow. The engine is in the rear but the driver sits up front steering with a small old-fashioned wheel. The houseboats are modeled after covered fishing boats and come in sizes up to 150 feet! We set off and made our way through smaller channels broken up by low islands and breakwaters covered with palm and banana trees. The weather was hot, but the breeze from our movement across the water made it pleasant. We crossed Vemdanad Lake and again headed down smaller channels, passing other houseboats, small houses and the occasional village. Occasionally we’d pass a small church as this area was a Portuguese colony in the 16th century and has a significant Catholic population. 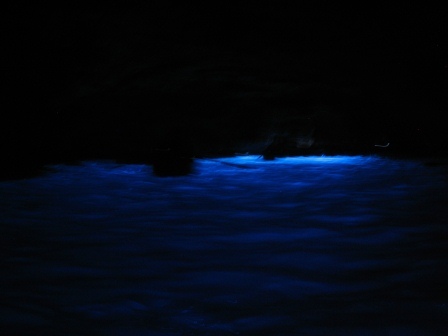 It was very beautiful and very relaxing. Enjoying a private houseboat trip through tropical canals with warm breezes and sunshine, enjoying good meals, and having everything looked after for us gave us a small sense of what the rich and famous must enjoy on their yachts. Here’s our dinner one night, complete with four freshwater ‘lobsters’! It is only a rough approximation though, as our trip was not without its challenges. Our house boat passed under a small bridge, but the recent addition of the upper deck made it slightly too high, which was easily corrected as our momentum bent back the entire viewing platform sufficiently for us to pass underneath. On the plus side, it did give the boat a more streamlined look. The metal poles that held up the viewing platform, the hand rail and the roof all sustained damage, which it turns out could not be repaired without the boss knowing about it (despite stops by the crew at two boat shops to see if something could be done quickly and more importantly secretively). At first they asked us not to tell their boss, a request which was later changed to tell him, if asked, that it happened on the morning of the second day, once it became clear that they would need to notify him by cell phone and didn’t want it to appear that they had delayed their report in an attempt to conceal the damage. I suppose they didn’t want to get in trouble, especially since the houseboat had recently been renovated and was damaged on its maiden voyage. There were a lot of mosquitoes at night, and we hung our own mosquito net because our newly outfitted boat didn’t have them. We needed it to be able to open the windows at night, even after which we were still too hot. Our room had an air-conditioner, but we didn’t think that we would need it, and so hadn’t paid the extra $25 to have it turned on. Do you suppose ‘J-Lo’ and ‘P-Diddy’ have these problems on their yachts? 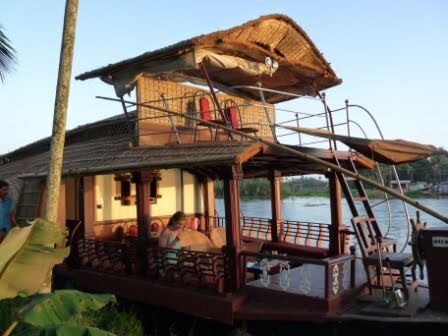 These issues aside, our guide book says that a houseboat trip on the backwaters of Kerala is probably the most expensive thing a budget traveler will do in India, but it also says that it is one of the ten things you should do before you die. We agree with both. 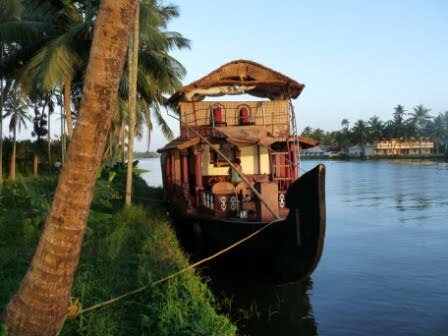 This entry was posted in Travel and tagged Alleppey, Asia, backwater, backwaters, boat, house boat, India, Kerala, travel, Vemdanad Lake on September 15, 2009 by dreambigliveboldly. Do you know the line from the Eagles’ song “Hotel California”, which says, “You can check out any time you like, but you can never leave”? Well, that’s what our last week has been like. Our objective is to get to Zambia, but we’re still working on it. We decided to head south from Rwanda into the little traveled country of Burundi. Our bus trip took about eight hours, which once again had its usual set of adventures (we will tell you more about that later). We arrived at the bus stop at 7 AM for our 8 AM departure and we barely got seats together. We ended up sitting across the aisle from one another, with a fold down jump seat in between us, and our backpacks squished in between our legs and the seats ahead of us. The bus was completely full, with a person in every seat, and luggage stacked in every available space. This included the space in front of the only door, which was stacked high with suitcases and boxes. The bus took us through the beautiful green hills of Rwanda. The roads were paved, and the driver drove at a reasonable speed, except for some of the downhill sections when it was raining. 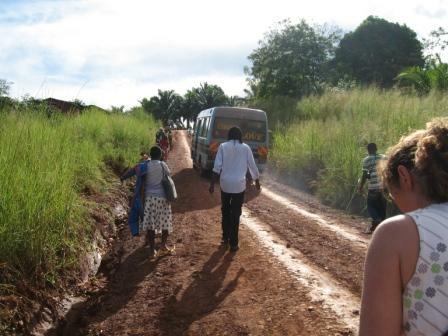 As is typical on East African bus journeys, the bus stopped frequently to drop off and pick up passengers. In the town of Butare, about eight more people boarded our already full bus. This involved a complicated ballet of removing all the luggage blocking the door, passing it out the window (with the passengers’ assistance), thereby allowing entry. 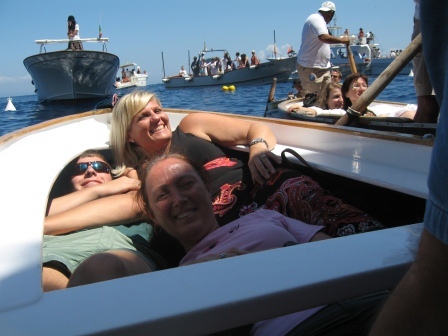 People were squeezed into every available space. Our row of four seats held eight people, plus our backpacks, and another six pieces of luggage. Luckily, many of the other people were children. Because they do not charge for children to accompany a parent, most women travel with at least two children and luggage, all of which try to occupy the same seat. Young babies are breastfed while an older sibling stands on top of the luggage between the mother’s legs. The children are amazingly well behaved, almost too passive, as they are crammed into the most contorted of positions. In many cases, we felt the need to lift a child’s head or remove the fabric covering its face for fear of injury, while the overburdened mother struggled with everything. It is quite common for children to be placed into any available space, including on the laps of others. Patrick had a young boy sleeping up against him, and Diane had at least two different children on her lap. She was quite fine with this, until she realized that one little girl was covered with small bumps, which could have been scabies, chicken pox, or perhaps bed bug or flea bites. The same little girl then starting throwing up corn onto Diane. We crossed the border into Burundi, made it to the capital city Bujumbura, and found cheap but reasonable lodgings in a Christian guest house over the Easter weekend. We began making our plans to continue our journey south, hoping to take a combination of two ferries down Lake Tanganyika to Zambia. Unfortunately, the first ferry, which was supposed to go to take us Kigoma Tanzania, hasn’t been running since the civil war ended last year. We confirmed this on Monday, after a failed trip to the port on Sunday afternoon. We set out for the port with the only other travelers that we had met in Bujumbura, some newlyweds from Toronto who had been volunteering in Uganda for the past three months. 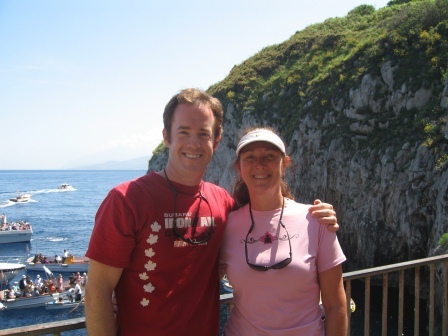 Terence is a recently graduated medical doctor, and Natalie a social worker. It was raining heavily and very humid, and the small taxi had no defroster, requiring Terence to constantly wipe the inside of the windshield with a cloth so the driver could see. We made it to within a couple of blocks of the port, when the car began to fill with water from the flooded streets. We were sloshing around in the back seat, while the driver beached his car up on some high ground, and then sat there, saying nothing. 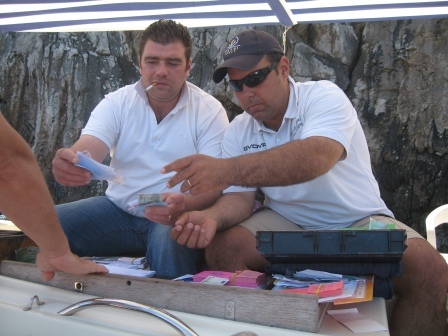 After about 20 minutes of sitting there in the foggy car, Patrick and Terence decided to try to wade to the port, which was visible in the distance. They made it to the port gates through the thigh deep water, feeling for each step, to avoid stepping into a hole or open sewer masked by the murky water. Patrick was thoroughly enjoying himself until they came across a huge syringe with uncovered needle that had washed up on the side of the road. The port was closed, so they returned to the car, and then headed in the other direction to check for an escape route. The water was less deep that way, and they returned to convince the driver that he could make it back to town safely. Back at the guest house, we decided to pay the driver his agreed fare, even though he never really got us to our destination. 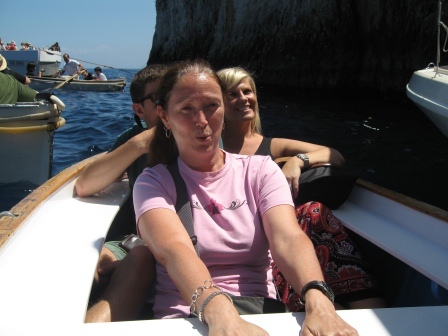 The following day, we went to the tourist office to enquire about a boat, and the head of the tourist office took us in his own car to the port, where we met with the port director. 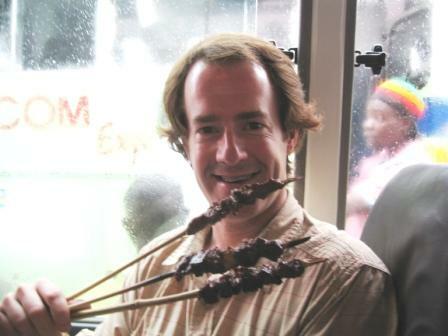 This gentleman has been the head of the tourist office in Bujumbura since 1991, when he returned after completing his master’s degree in tourism in Europe. 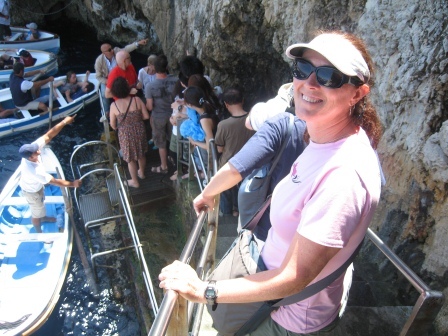 The office has been open, but there have been no tourists for the last 18 years! The port director confirmed that there was no ferry but that we could perhaps go on a cargo ship. Like many of the buses we’ve experienced, cargo ships leave when they are full, and it isn’t possible to accurately predict when this might occur, so we abandoned our search for a boat, and pursued an overland option. 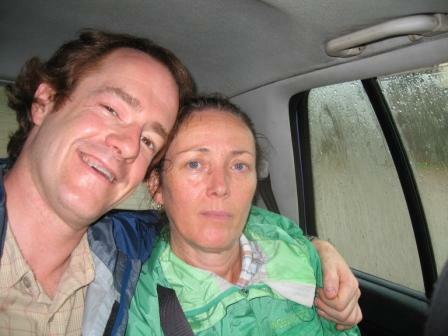 We arranged for a car for the next day to take us down the coast and through the mountains to the Tanzanian border. The driver was a young man named ‘Jamie’, who spoke French but no English, and did his best to make sure we were looked after. Over breakfast, he told us how his mother and relatives had been killed in the war, and how as a child he fled with his younger siblings into the forest, and then back and forth between neighbouring countries to avoid a similar fate. Nearing the Burundian border, we stopped in the last town to get an exit stamp in our passports. Terence and Natalie hadn’t kept the receipt they were given upon entry to Burundi, which it turns out wasn’t actually a receipt, but the Burundian transit visa we had each purchased. Of course, no one had told us this. Luckily we found ours, and we received an exit stamp without incident. However, the obnoxious border guard took advantage of their predicament to elicit a bribe of about of $10 Canadian, but not before making them wait about thirty minutes, during which time he accepted bribes from a bunch of Africans, presumably for some other spurious reason. Jamie the driver literally got down on his knees to beg the immigration officer to accept the bribe and give them the required exit stamp. When we reached the actual border about 18 kilometers further on, Jamie convinced the gate guard to let him continue with the car through the ‘no man’s land’ between the borders, on the condition that he provide the car registration to the guard to ensure that he would return. We made it to the remote Tanzanian border post, purchased transit visas, and then arranged follow-on transit to Kigoma. Of course, the only option was another bus! This bus trip took about four hours, through beautiful rolling hills. It was accompanying by the usual cramped conditions, and the constant reorganizing of the bus at each stop to cram in the latest people and their belongings. On this trip, they included large bags of grain, a big set of speakers, and many boxes and bags. Once everyone is loaded, the bus begins to move, at which time the driver’s assistant begins to collect the fares. Because he can’t move from his cramped position, the money is passed forward and back by the passengers. There are no tickets or posted prices, so there is often loud negotiation between parties at opposite ends of the bus. On this trip, a young man who wasn’t willing to pay the requested fare was thrown off the bus along with his belongings (except one item which was held for ransom until he paid a small amount for the portion of the trip he had ridden. When we reached a hill that was too steep, we would all get out to walk up the hill, so the bus could make it up. When the left front tire of the bus blew, we all got out again so they could change it. Seated ahead of us was a doctor from the Democratic Republic of Congo, who told us that the driver had received a telephone call that a bus one hour ahead of us on the same road had been robbed by bandits. Diane heard this, and kept her cool, because the alternate to proceeding was to sit out on an open hill top with a flat tire and wait for the bandits to come to us! We made it to Kigoma, and found cheap accommodations in the city. Perhaps too cheap though, because our room had a cockroach in the bathroom and another bar outside the bars on the window. Luckily the music only went until midnight, so Patrick and Terence drank beer in the bar until closing, telling their wives that they were guarding the bedroom windows from the other side. The next morning we were woken before 8 AM by an immigration official with the hotel register who wanted to check our passports. After complying to his request, he then gave us a lecture about not showing our passports to anyone who doesn’t show his ID first, because there are conmen and thieves about. We continued our search for transportation to Zambia. The next boat, which was supposed to leave on Wednesday, was now only running every second week, and this was the wrong week. The train was full for the next ten days. We were both frustrated, and Patrick decided that we needed to do something drastic, so we call the airport, and were told that there was a flight leaving for Dar es Salam within the hour. We got a cab, raced to a bank for money, then headed out to the airport in the middle of a rain storm. The road to the airport was unpaved, deeply rutted, muddy, and mostly underwater, but the taxi driver got us there in his Toyota Corolla. Unfortunately, there was only one seat left on the plane, so we headed back to town dejectedly. We walked to several hotels trying to find a decent one, as we were now facing a stay of at least two more days in Kigoma, and finally found something. Diane was close to breaking, but held in there. Once she had a room, a cold shower, and some lunch, she perked up again. We did eventually fly out of Kigoma two days later, and asked our taxi driver there to stop at the train station so we could investigate trains back to the southwest of Tanzania (near Zambia). Trains leave twice a week, but luck was on our side this time. There was a train scheduled to depart immediately, actually it was overdue, and we could still get a first class compartment. The 24 hour train ride to Mbeya was actually quite pleasant. It was loud and difficult to sleep, but the scenery was beautiful as we crossed the full width of Tanzania. There was food on board, which took forever to be prepared, but was edible, and there was beer, which could be cold if you timed it right. The latrines were basic but not disgusting, and we even took a cold shower out of a bare pipe sticking out of the bathroom wall. All in all, it was quite pleasant, and not a bad way to spend Diane’s birthday. We arrived in Mbeya at about 4 PM, still with time left to celebrate Diane’s birthday. After finding a hotel, we headed for the best restaurant in town. Actually, it’s 20 kilometers out of town at a coffee plantation, but it was worth the drive. They had a lovely view at sunset, good food, and wine by the glass. This was the first time Diane had drunk wine in over two months, which is a new record. Of course, it’s had to find time to drink wine when you’re busy drinking beer! Unfortunately, we were too tired to stay for coffee, which Diane also hasn’t had (other than instant coffee) for over a month. Anyhow, after a week of trying, we’re now within striking distance of Zambia. We’ll let you know how it goes. P.S. We promise this will be the last bus story, unless something particularly heinous happens. This entry was posted in Travel and tagged Africa, boat, Bujumbura, Burundi, Bus, port, Tanzania, transport, travel on April 21, 2009 by dreambigliveboldly. We’re writing this after dark from the cushions where we will sleep on the deck of our felucca. A felucca is an Egyptian sailboat, which have been used on the Nile for thousands of years. 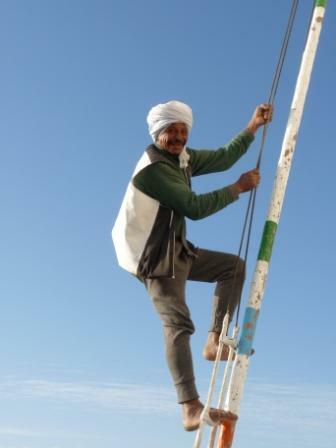 Our felucca is only 20 years old, but it has a new sail, and a good crew. Today was our second day on the felucca, sailing from Aswan down the Nile to Daraw, a village within driving distance of Luxor. We arranged the felucca by talking to locals near the harbour. Our first two attempts at negotiation failed, one due to a high price, and the second due to Diane’s bad feeling about the captain. On the 3rd try, we found a good captain, and negotiated a reasonable price. After inspecting his boat, we made arrangements to return after dinner, to meet the other crew member and go shopping for food in the local market. The captain’s name is Hamedi. He is 32 years old, and is due to be married within the year. He comes from a village on the Nile near Aswan. He is Muslim, and prays every time we stop the felucca. He is one of 11 brothers and his 84 year old father has dementia. He speaks very little English. The other crew member, who is also the cook, is named Saeed. He is 55 years old. He was born is Sudan, and first came to Egypt down the Nile from Sudan when he was 9 years old. As a boy, he worked driving camels from Sudan to Abu Simbal, near Aswan. The camels traveled in the desert in the night, so as not be distracted by the greenery of the Nile, and to avoid the snakes and scorpions. Each trip took 30 days, and they navigated using the stars. Saeed speaks some English, but never went to school, and cannot read or write. Saeed has 3 children – 2 boys and a girl, who recently gave him his first grandchild, a girl. Saeed’s wife died when his son was 6 years old. She was recovering from some sort of abdominal surgery, and aggravated her injury when rescuing her son from the Nile. Both Hamedi and Saeed are smokers, who smoke cigarettes laced with marijuana and hashish. They have spent their whole lives working on the Nile, and take good care of us. In fact, the last 2 days have been very relaxing. Hamedi sails, and Saeed cooks. He makes us Sudanese food, which includes vegetables, rice, bread, lentils, and perhaps some meat. For breakfast today, he made us eggs, and with our bread we had jam and some sort of cheese resembling cream cheese. Our felucca is named Sendbad. I think it’s supposed to be Sinbad, after the famous sailor and adventurer. It is about 7 meters long, with a draft of 1.5 meters. It has a large triangular sail, and a keel which can be lifted up in shallow water. The rudder is large and made of wood. We sleep on some boards spread between the 2 sides of the felucca, which are covered with cushions. They provided Diane and I with two blankets, by special request, which we use one on top of the other for extra warmth. There is a canopy, which is closed on 3 sides, made of an old sail. There are no mosquito nets, but there is no malaria in Egypt, and there are surprisingly few bugs. The total distance we’re traveling is not great, about 35 kilometers, but feluccas only go about 15 to 20 kilometers per day. 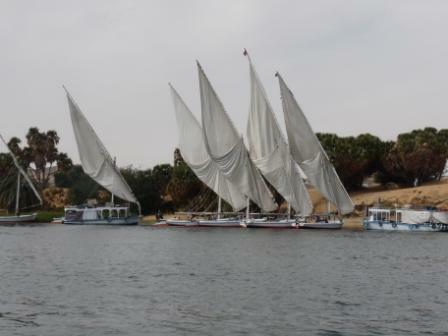 We are traveling the whole way with the current but against the wind, which requires tacking from one side of the Nile to the other, and provides us with great opportunities to view things along the banks. 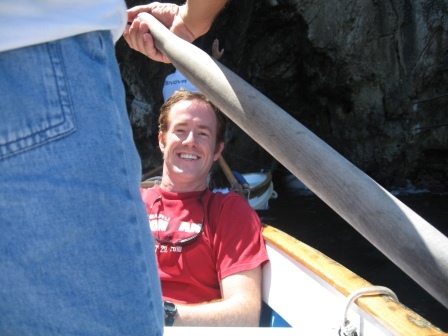 This morning Patrick steered the felucca, until he was relieved of command by Hamedi, probably for going too slow. The Nile is a busy river. 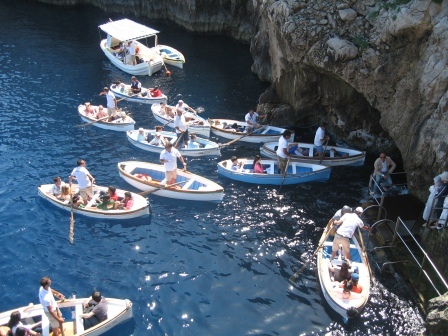 In addition to the many feluccas, there is the occasional ferry, or dredge, or rowboat with a fisherman. 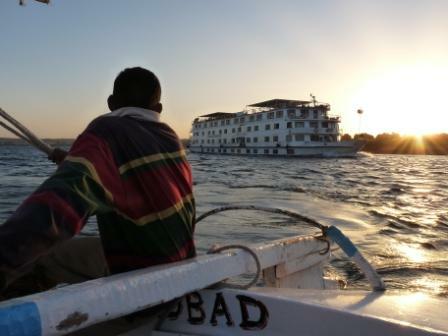 There is a steady stream of cruise ships, which travel between Luxor and Aswan. The clog the waterfront in Aswan, up to 100 ships at a time, blocking the view of the Nile, and running the engines all night long for power. As a result, the riverfront restaurants of Aswan are not what they used to be when Agatha Christy wrote “Death on the Nile” here. The last two days have been very relaxing. 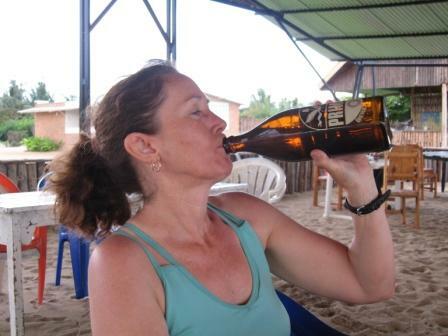 We spend our time reading, eating, drinking Stella, and taking small walking excursions on the shore. Tonight, we sat around a fire on the shore, before returning to the felucca to write this and head to bed. It is said that a trip to Egypt is not complete unless you have traveled on the Nile. It is one of the world’s great rivers, and has been a terrific experience for us. This entry was posted in Africa, Travel and tagged Aswan, boat, Egypt, felucca, Nile, river, travel, trip on February 25, 2009 by dreambigliveboldly.